Wholegrain brown basmati rice. 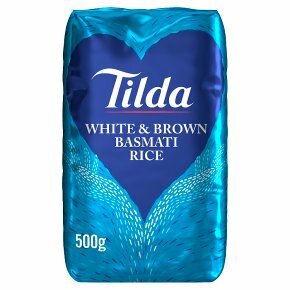 Gluten free.The Tilda Basmati Promise: Naturally sun-kissed, matured grains for exceptional taste Each batch is purity tested to remove inferior grains For half a century we've known that Basmati belongs to the heart of every home and the centre of every table. Our love for this ancient delicacy means we never compromise; only exceptional is ever good enough to carry our name. Using the finest quality grains means our Basmati is simply full of natural goodness and a long, fluffy texture that you'll adore from the very first taste. Your kitchen deserves the best; trust us to bring you rice like no other you'll find on Earth and that you'll always be proud to serve. Tilda Truth We purity test every single batch to ensure exceptional quality, time after time. There are many different ways to cook rice - this one is really simple:1. Add 60g of Basmati per person to a large pan of boiling water.2. Cook on medium heat for 25 minutes.3. Drain well, cover and let stand for 3 minutes then lightly fork through the grains and serve.